Opinion about Russia varies widely throughout the world, with some of the most striking differences evident among nations formerly tied to the Soviet Union. In Ukraine and Bulgaria, positive opinions of Russia surpass negative sentiments by wide margins. But the balance of opinion is decidedly negative in Poland. And while most people in the Czech Republic express unfavorable opinions of Russia, the majority view is positive in neighboring Slovakia. Overall, majorities in 14 of 47 countries surveyed say they have a favorable opinion of Russia, while majorities in 10 express negative opinions. Views are more mixed in the remaining countries. Russia is viewed in mostly negative terms in Western Europe. Great Britain is the only country from the region in which Russia receives more favorable than unfavorable ratings, although even here only 47% have a positive opinion. Meanwhile, majorities in France (65%), Germany (62%), and Sweden (59%) express a negative view. In Canada and the United States, opinions about Russia are somewhat more favorable than unfavorable. In the U.S., 44% are favorable, 35% unfavorable, while a relatively large minority (21%) declines to offer an opinion. Views of Russia are generally favorable in three major Asian countries: India (58% favorable), China (54%) and South Korea (54%). But more people in Japan (67%) express negative opinions of Russia than in any other country surveyed. In the Middle East, Jordanians, Lebanese, and Egyptians are divided in their views, while Israelis, Turks and Palestinians give Russia solidly negative assessments. Africans tend to have positive views of Russia, with the important exception of South Africa, where unfavorable ratings (52%) outweigh favorable ones (30%) by a significant margin. Finally, in Latin America many respondents are unable to offer an opinion, and neither the favorable nor unfavorable position is selected by a majority in any country from the region. Many Europeans are concerned that their countries are becoming too dependent on Russia for their energy needs. 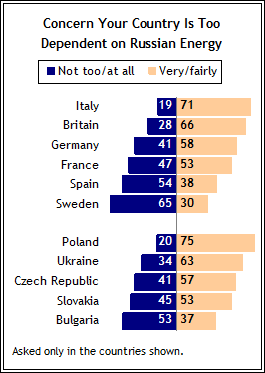 Majorities in most Western and Eastern European nations say they are very or fairly concerned that they rely too much on Russian energy resources, and worries are particularly strong in Poland (75% very or fairly concerned), Italy (71%), and Great Britain (66%). Anxieties also run high in Ukraine (63%), which had its natural gas supplies from Russia temporarily shut off during a price dispute with Russian state-owned gas giant Gazprom in January 2006. In most countries, concern about dependence on Russian energy is correlated with negative views of Russia. For instance, in the Czech Republic 62% of those who are very or fairly concerned have an unfavorable opinion of Russia, compared with 44% of those who say they are not too or not at all concerned. In Ukraine, however, Russia is viewed about as positively by those who express concern about dependence on Russian energy as by those who are not concerned about this.